(Newser) – Cataract removal is the most common surgery in the US—and now a massive new study finds the operation could be prolonging the lives of the more than 3 million Americans who get it every year, the New York Times reports. 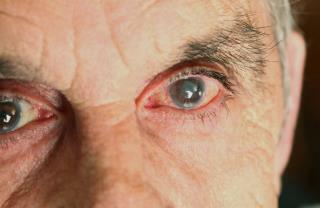 Cataracts are "clouding and discoloration of the lens of the eye." They cause fuzzy vision, trouble seeing at night, and more. According to Reuters, about half of all Americans develop cataracts by the time they're 80 years old. A 20-year study published in October in JAMA Ophthalmology looked at more than 74,000 women over the age of 65 who had cataracts and found the ones who got their cataracts removed were 60% less likely to die during the study period. There were an average of 1.5 deaths per 100 women who got the surgery per year; the average was 2.6 deaths for women who didn't get the surgery. Correlation does not prove causality. Maybe it means that people with better access to health care live longer. Great,damn wheelchair wrecks at the nursing homes is getting to be a big problem.